In real time, you will get a full analysis of your teams' call activity. This can be very useful for a manager who is trying to improve his Customer Support / his Sales. Better customer experience means higher satisfaction rates and increased sales. Average Waiting Time: That is the average time your customers have been waiting before your team picked up the phone. 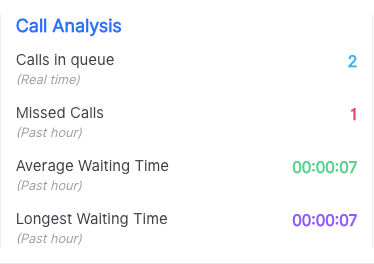 Longest Waiting Time: That is the maximum time your customers waited before one of your call agents picked up the phone.